At May St Dental Centre, our team promotes a conservative approach to dentistry with no unnecessary treatment and a focus on preserving your existing teeth whenever possible. In some cases, an extraction may be necessary. If so, our dentists are skilled in performing gentle extractions while you are comfortably under sedation. If you are in pain or think you may need to have a tooth extracted, we will be happy to consult with you and identify what your needs are. We can perform extractions in-house without having to refer you. Once we have determined that an extraction is the best way to proceed, we will take X-rays to see how best to perform the extraction. These images are especially important in planning the extraction of wisdom teeth, which can erupt improperly. When we have decided, this minor surgical procedure will be completed, taking 20-45 minutes depending on how many teeth are to be removed. Sutures are then placed, which will be taken out after a week at a follow-up appointment. 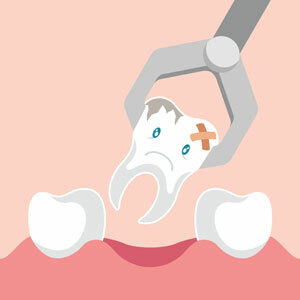 Stop bleeding by biting into a clean gauze, putting pressure on the area of extraction. Our range of services will help you improve and maintain your oral health. Contact us today to book a consultation for extractions and wisdom teeth East Fremantle! Emergency cases are welcome.